Coastal Vibes - Creative Flow Co.
Hey There! I know I’ve been MIA lately (I mean it is wedding season and all!) but I finally got the chance to sit with my computer, away from all the chaos and share this beautiful day at the beach with you. You know me! I can’t help but get together with my amazing industry friends and create something beautiful. Being a Bay Area Wedding Planner, I get to work amongst so many talented and creative individuals. And it’s truly an honor, especially when the all stars come together to help bring our vision to life. We adore outdoor San Francisco Weddings. But if you’re from the Bay Area, you know a nice sunny day in SF is hard to come by! The haze over the city is a norm. So why not embrace it?! We’ve been dreaming of foggy days along the San Francisco Coast line, monotone color palettes, and delicate airy accents. And this is what we created. Beautiful lush blooms graced the gray tablescape and grey taper candles glistened in the sun. Delicate calligraphy on plexi glass highlighted the first and second courses of the menu. And know what’s even better than this combination?! Having this one of a kind shoot featured on AisleSociety.com. See the full feature here: Coastal Blues. “Inspired by the beauty of the California coast, this romantic shoot features a beautiful water skyline and the natural hues of the of the waterfront. Incorporating tons of beach elements, the sea glass, airy table runner and wind blown linens match the grays of the San Francisco sky. Feminine accents lined the beautiful tablescape highlighting the glass menus with delicate calligraphy, clean monotone plates and clear ghost chairs. The beautiful centerpiece featured lots of big blooms combined with organic touches and loose greenery. Abalone shells housed the fresh himilayan sea salt with shell accents on beautiful marble plates. 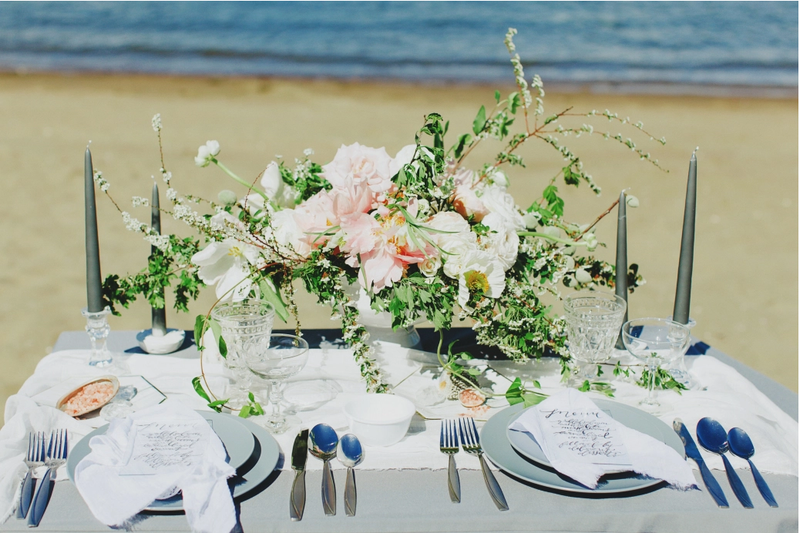 Elegant desserts, sun kissed by the sun, were spread along a natural wood palette and were the perfect addition to the light and airy beach wedding.